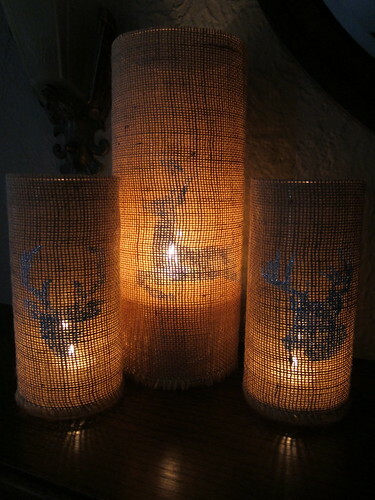 Earlier this fall Matt pointed out some burlap covered hurricane lamps with images stenciled on them to me at a high-end decor shop. 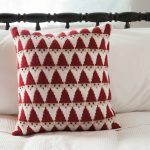 I loved the look and thought it would go great with the white, silver and natural Christmas decor I was planning. I also knew I could make these lamps pretty easily. So, I bought all the stuff I needed, burlap and large glass candle holders, and there it sat. This Iron Craft UFO challenge gave me the push to finally get them done. 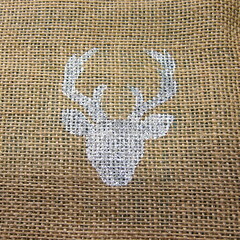 The ones I originally saw had the images stenciled on in red which really stood out on the burlap. I went a little subtler with the white, but I also added glitter. They have a pretty golden glow when lit. 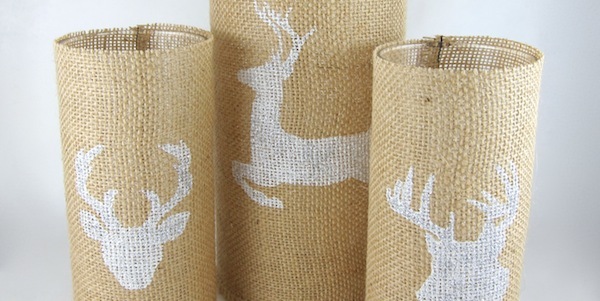 This is a pretty simple project, though the burlap can be a little fiddly to work with. Just handle it carefully and make sure to backstitch at the beginning and ending of your seam and you’ll be fine. 1. 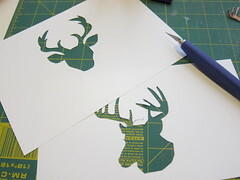 If you are not using a store bought stencil, print or draw your design on cardstock. Keep the size of your candleholder in mind when doing this. Cut design out with the exacto knife. If you have an interior piece like I have in the side view deer head above, make sure to keep it. 2. 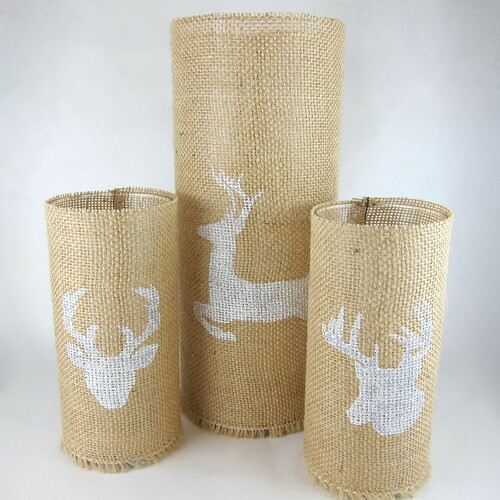 Cut a piece of burlap out that is the about 1″ tall and 2″ wider around than your candleholder. 3. 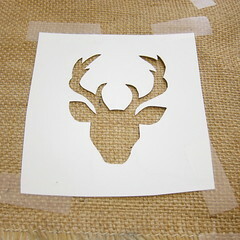 Lay the burlap out on a piece of paper and tape the stencil to the middle of it to secure it. If you have an interior piece, you can use a small piece of double stick tape or even a little glue stick to hold it in place. 4. Pour some paint out and dab the pouncer into it. 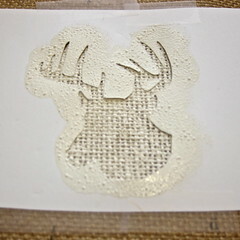 Carefully dab the paint on the burlap showing through your stencil. 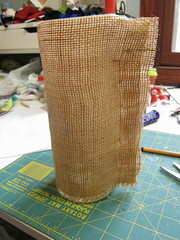 Try not to put the paint on too thickly or it will fill in all those burlap holes. 5. If you want some shine, sprinkle some glitter on the wet paint. 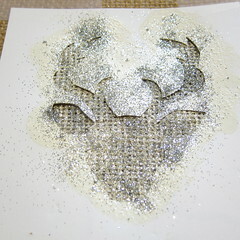 Keep in mind a lot of the glitter will fall off once you take the burlap off the paper. 6. 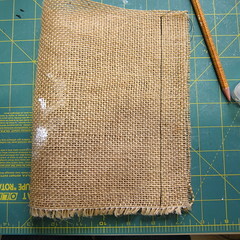 Let it dry slightly and then carefully remove the stencil from the burlap. If you wait until it dries completely the stencil will stick a little and you may have some paper to clean off the burlap. Let dry completely and shake off excess glitter. 7. 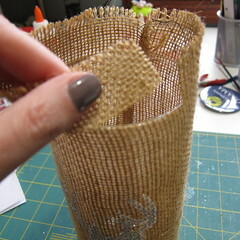 Wrap the burlap around the candleholder with the painted side facing in. Pin the ends so it is tight around the holder, but can still slip off. I drew a line on my pin line to help me sew. Mark the spot where the top of you candleholder hits the burlap as well. Sew down that pinned line making sure to back stitch at the bottom and where you marked the top of the candelholder. I used black thread so you could see it easier in the pictures, but I suggest you use brown. 8. 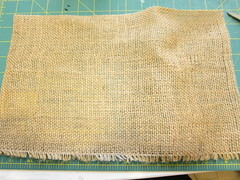 Turn the burlap right side out. Slip on the candleholder. Trim the excess at the top. One of the things I like about these candleholders is that the burlap covers slip off, so I can use the holders the rest of the year. 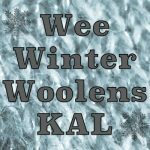 6 years ago by Kat in Christmas , Craft Projects , Crafts , Holiday , Projects | You can follow any responses to this entry through the RSS feed. You can leave a response, or trackback from your own site. Oh, that great. Take a picture & post it in our Flickr group so we can see yours. Is great! !Well done! !I like it! !